Mrs. Delisa McCall is a shining star at Starr Elementary! She has been teaching at Starr for over 17 years, and currently teaches 3rd-grade science and social studies. "What happens in science and social studies class is the first thing out of my son's mouth when I ask him about his day. She makes the subject come alive for him through hands-on activities, group work, technology, and an interactive notebook. When he uses vocabulary from her classroom, he uses it in an appropriate context, showing a depth of understanding. Studying for her class is a breeze because her class is more than memorization of notes. Mrs. McCall is the first teacher he sees every day, and I believe she starts his day off right! She not just teaches my child but challenges him through his interests and in ways that he enjoys. This shows she cares for her subject as well as her students. "I love the students. I love knowing that I get to be such a big part of their lives, for at least 180 days. I think it is safe to say that there is no other job like teaching." "I have been married to my husband for 15 years, and we have three amazing children. Annalisa is 12 and in the 6th grade at Starr-Iva Middle School. Colton is 9 and is a 3rd grader, and Eden is in Kindergarten right here at Starr with me. I love to travel, spend time with my family and friends, go to the movies, and almost activity with water (ocean, lake, pool, you name it)"
What is something someone may not know about you? "I originally went to college majoring in journalism. I was going to be on the news! I even was a radio DJ for a few years in high school and was the lead anchor on our university television station. Speaking of that, I am a graduate of the University of South Carolina, not many people know that because I LOVE my Tigers! 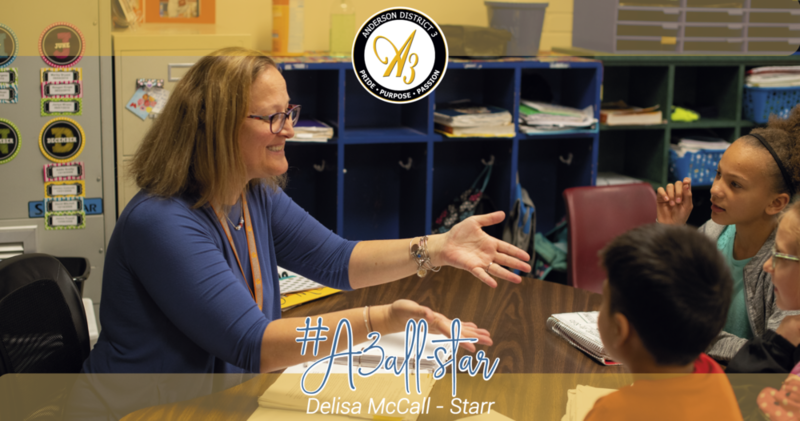 Thank you, Mrs. McCall, for being an #A3AllStar for the students of Starr Elementary School!